unshakeable trust and gently guide them to the buy button. What if there was a way to make your words sparkle? From a humble email to a might salesletter - what if your words could impact them with such intensity that the reader can't draw themselves away? If they enveloped the reader and guided them down the page like a written sales assistant helping you to make sales all day long? How would that impact your sales? This product was created to do just that, to teach you how to get inside the head of the reader and to write words that plug directly into their brain so they are hardwired into your sales message until you choose to let them go. It is an indepth look at the love-hate relationship we have with words and how to use them to get the results you want. As part of the book we'll look at one of the most powerful pieces of writing ever made - Martin Luther King Jr's 'I have a dream' speech, think you could learn a thing or two from that? How to write in a way that looks normal to everyone else but your chosen reader will home in on it like a guided missile and know you are talking to them! The 5 devious psychological triggers you can implant into your writing to get what you want! 100 power words you can use to make explosive headlines and bullet points, use with care! Two ways to take bland writing, squeeze some special sauce onto it and turn it into a sizzling writing sensation! of mediocrity and you can stand up and collect your reward of more customers and more profits! You've gone to all that hard work to get someone to your site or your article or whatever, then most people just let the reader fall gently asleep reading the same regurgitated nonsense they have seen on hundreds of other sites and hope to make a sale? C'mon! People have very short attention spans, you grab them by the balls (eyeballs that is...) or you lose them. You either entertain them with your words or they'll go to youtube and look up some funny clips of kittens doing silly things. That is how this works. They either need to be so compelled to finish reading your work that they would chain themselves to the desk if someone tried to prise them away, or they need to be entertained so they can escape the world momentarily and escape the lousy day they had at work! With this report you'll learn to write effortlessly what other people would kill for. You can use that for anything you want, from writing the best love letter your partner has ever read (brownie points up for grabs there!) through to selling ball bearings, the same principles apply and you can master them all today. I know the power this book has to change your online success forever. So the risk is totally on me, unless you are absolutely thrilled with the results of this book then at any time within 10 days of purchase just shoot me an email and I will refund every last cent to you. No questions asked. You'll have the 'midas touch', all that you write will turn to gold, think of the unfair advantage you'll have over your poor competition! I'm here to run a business so I can't just give the information away for free, but then this priceless information could help you out so much that I don't want to price it out of people's reach, so $12 sounds fair to me, I get a fair pay for my work and you get your hands on some of the most powerful information out there to turn you from an 'average joe' writer to a writing superstar with groupies and all! 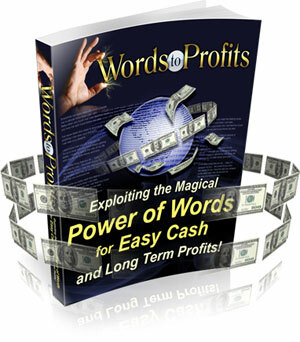 Look at it this way -- $12 is really a painless drop in the bucket to be able to get your hands on 'Words to Profits' and start using it right away to improve every area of your business! Click here to order right now for only $12 (even if it’s 3:00 am in the morning). Take a good long look at your writing, is it all it can be? There's no doubt about it, if you can master the power of words then you'll have a skill for life that you can use on and offline to motivate, persuade, touch and entertain people. Don't you owe it to yourself to try Words to Profits today? P.P.S Every second you don't have this information then your writing is lying there unpolished, never earning as much for you as it could be, an unpolished diamond sitting there waiting for someone with a keen eye to spot it and give it the attention it needs.